Every week hundreds of drainage rings of all different sizes are produced from our forms. For 45 years our customers have had a hand in developing a high performance drainage ring form making the best use of your valuable man hours. 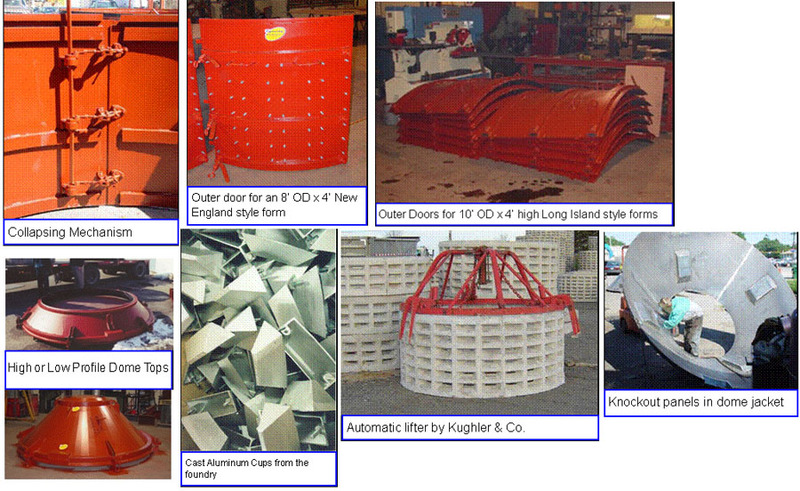 Whether in Long Island, Connecticut, Upstate New York, New Jersey, Ohio, Utah, Pennsylvania, Massachusetts, Virginia, Delaware, Maryland, Rhode Island, New Hampshire and everywhere else they've been tried, they have proven to be the most reliable, easy to use forms for round drainage products. Once our product has been introduced in an area it quickly becomes the standard for the region. The Long Island style form makes a riser section only. They are available in a 4" or 6" walled configuration and require a separate mold for the top slab or dome along with a shovel plate. Rings are installed with either a dome lid or a top slab. Rings may be stacked. With runoff retention becoming more important all the time you need to the the best, most efficient, easy to use, and longest lasting drywell forms out there... Dynasty Forms ! • 3/16" plate reinforced with 3" channel and 1/4" top band. • Cast aluminum cups last longer than rubber or plastic. • Cups bolt into the doors for easy adjustment or replacement but do NOT need to be removed to strip the form. • Locking handles for rapid setup. • 1/4" Plate with 3" Channel ribs. • Heavy duty adjustable collapsing mechanism. • Heavy plate lifting eyes for easy handling. • 4x1/2" ring burned out of 1/2" plate.